Alessandro was sentenced to 30 years in prison. For a long time he was unrepentant and surly. One night he had a dream or vision of Maria gathering flowers and offering them to him. His life changed. When he was released after 27 years, his first act was to go to beg the forgiveness of Maria’s mother. 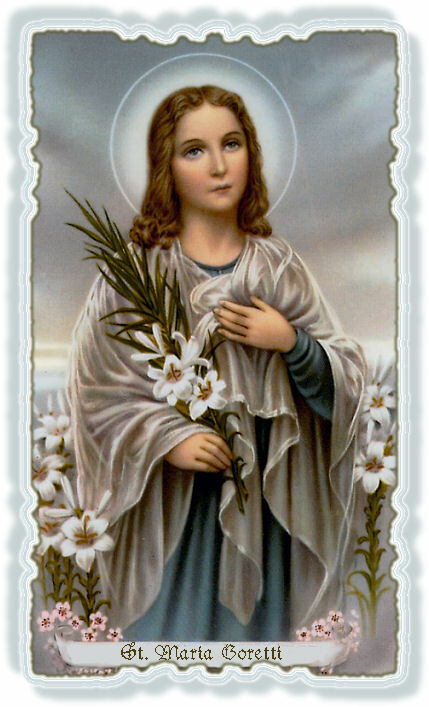 Devotion to the young martyr grew, miracles were worked, and in less than half a century she was canonized. At her beatification in 1947, her 82-year-old mother, two sisters and a brother, appeared with Pope Pius XII on the balcony of St. Peter’s. Three years later at Maria’s canonization, a 66-year-old Alessandro Serenelli knelt among the quarter-million people and cried tears of joy.